Slicetruck: "It's thin and It's wonderful" "Majestical"
"It's thin and It's wonderful" "Majestical"
Opening night was a monster success, hopefully we can figure out a way to make enough pizza in our little truck to satisfy the huge demand for it. Above is the picture of our first customer. Thank you young lady for setting off the New Year's Eve pizza slice tidal explosion of 2009 in Hollywood, CA. 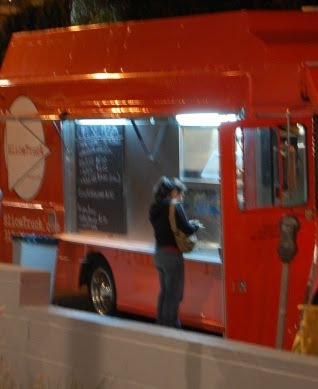 ...a tip for some people in the new year: SliceTruck does not sell tacos. We'll be downtown tonight court side at the Lakers game. UPDATE: turns out we're not going to the Lakers game but instead will be downtown selling majestical pizza. And of course, we wish you all a successful new year! Unless you're some sort of psycho and want to successfully accomplish some psychotic feat, this probably goes without saying but felt like someone needed to say it. People need to be more careful about who they're offering their wishes to and I'm trying to start this year off on the right foot by not offering those psychos my best wishes. The free plate looks great displayed with my china colection. Thank you Slice Truck.